WordPress theme development is more than just creating an appealing design. It includes writing clean code, testing of all types of content, and using the right template files. However, one of the most important things to take care of is the WordPress theme development standards. Yes, there are certain Theme Development standards set by WordPress which should be followed strictly. Therefore, we have gathered important standards to help you get started with WordPress theme development. There are certain simple yet important policies to write standards-validated code. Writing W3C compliant code is one of the most important things. If your code is not W3C (World Wide Web Consortium) validated, it would be considered as an error. W3C compliant websites load faster and get higher search engine rankings. Therefore it is extremely important to always keep in mind W3C standards while writing the code. Self-closing elements: Elements should be enclosed in proper self closing elements. The W3C standards specify that you should precede the self closing elements with a single space. Wrapping the attributes: It is always suggested that you should wrap your attributes in either single ” or double "" quotes for better readability. Indentation: Since HTML is used with PHP, proper indentation is required. Use tabs instead of spaces. Like HTML, CSS coding standards were introduced to set a baseline for collaboration. Selectors: Use hypens and lowercase letters to name “class” and “ID” in your stylesheet. Properties: Terminate all the properties with a colon and a space. Use only shorthand for padding values, margin, list-style, font, border, background and hex code for colors #000000. Property ordering: When it comes to writing properties, there is a particular order which should be followed. Spacing: use liberal spaces for better readability. Indent with spaces and do not use any whitespace at the end of the line. Also, any comma “,” and “;” should not have any following space. Objects: Object declarations should be made in different lines with one property per line only if that declaration is too long. Function calls and arrays: There should always be extra spaces around elements and arguments though there can be certain exceptions. There are numerous coding standards to keep into account when it comes to PHP such as Yoda conditions, Regular expressions, whitespace usage, single and double quotes, naming conventions, and formatting database queries. You should always test your theme before putting it online. It should be able to deal with a variety of user data. There are various plugins available to help you test your theme such as Monster widget, RTL Tester, Theme mentor and much more. You can also make use of WordPress theme unit test. 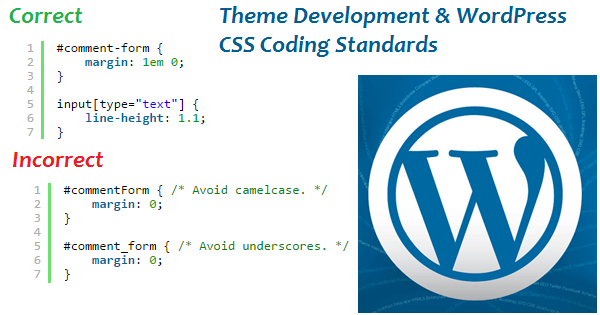 Aforementioned are some of the major WordPress theme development standards. WP comes with some default themes. You can check these themes to have a better idea about development and coding standards. WordPress standards play a crucial role in theme development and therefore should be strictly followed when building a theme in WordPress. Author Bio: Elvin Roy is a passionate WordPress developer who is associated with Wordsuccor-Best Company for WordPress Plugin Development. She has been working here from last 4 years. Wordsuccor provides you many services like Custom WordPress Development Services, Conversion of HTML to WordPress and many more. You can also follow her on Twitter.